Whether you are looking for general dental, cosmetic, or advanced restorative and implant dentistry, their skilled and compassionate team are dedicated to providing the quality, comprehensive care you deserve in a friendly, safe environment. Founded in 1970 by the late Morris Ostrach, Light & Conforti, D.M.D.S.’ dental practice has long been the home for excellent dentistry on Providence’s East Side. Through the years they have maintained a commitment to quality care while staying on the cutting edge of advancing innovations and techniques. The doctors at Light & Conforti, D.M.D.S. 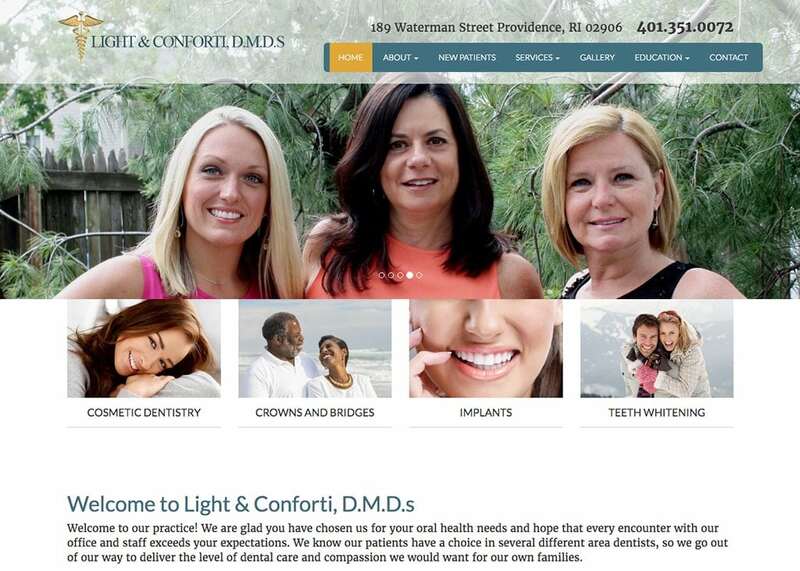 wanted to present a friendly and welcoming atmosphere for their dental website by using light colors. The main slideshow displays pictures of their practice and staff to provide a comfortable setting for visitors to their site. Featured images located below the main slideshow illustrate four of the major services offered at their practice. The menu at the top uses bold colors against the light background to draw attention to easily accessible information about Light & Conforti, D.M.D.S.